A number of years ago, someone taught me about a pyramid chart – a handy visualization for categorizing beliefs or practices. 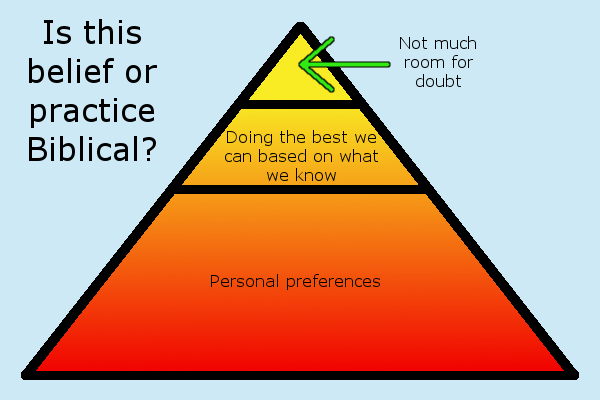 At the base of the pyramid are personal preferences – things the Bible is silent about. At the bottom of the pyramid is stuff that really doesn’t matter much at all in the grand scheme of things. For example, I chose to eat wholegrain cereal for breakfast, someone else chose to eat a donut. In the middle of the pyramid is all the things the Bible does mention and principles from the Bible do apply, but exact practices are not outlined and/or nitpicky details aren’t given. With this middle section, each individual and/or church is just doing the best they can with what they know. Communion traditions such as intinction or presenting the elements separately should go in the middle of the pyramid. This section isn’t nearly as big as the base of the pyramid. At the top in its own teeny tiny triangle are the things that the Bible doesn’ t leave much wiggle room for debate. 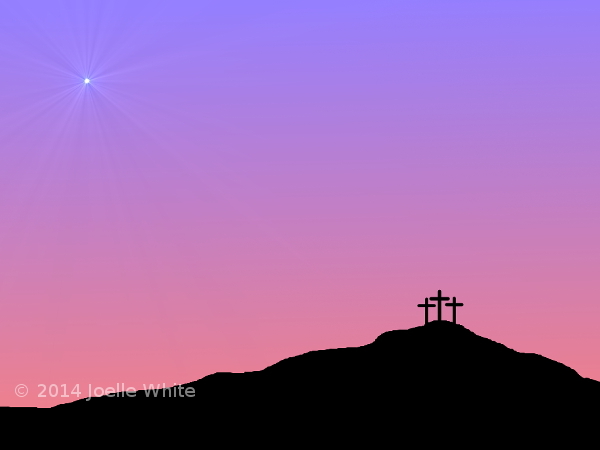 Jesus’ resurrection definitely goes at the top. Of course we as human beings will debate the Bible anyway, but you get the idea. A small minority of Christians skew the pyramid so badly that they have the top section take up almost the entire pyramid. “GAWD delivered me from that donut and SAID unto me, (1 Cor 6:19) ‘The body is a temple of my Holy Spirit,’ so I say to YOU people GAWD wants us to eat oatmeal with NO SUGAR for breakfast!” By the way, if you look at the context of the Bible verse referenced, it’s about something a lot more fun than donuts. These people might say that Christians shouldn’t have anything to do with Karate because it’s not in the Bible (neither is brushing one’s teeth) and because it’s from a part of the world that developed different belief systems (genetic fallacy). Don’t tell me there aren’t Christians who act like this – trust me, I’ve met some and I’m very glad they live thousands of miles away from me. I submit that Karate and self defense in general can have a place in a Christian’s life, and it belongs firmly in the bottom section (personal preferences). Therefore Karate is not as earth-shattering an issue as, say, the forgiveness of sins through the sacrifice of God’s own Son. No, this doesn’t mean moon your attacker – that’s a bad tactical move because your back is turned to your opponent and your trousers tie up your legs! I could try to pick apart every word in Matthew 5:38-42. I could ask those who have studied the original languages for help and insight, but I don’t think that’s necessary. The first thing I notice is these are not life-threatening situations. They have the potential to escalate, but Jesus doesn’t want us Christians to escalate things. He wants us to respond with love that goes the extra mile. I hear you saying, “Hey, someone hauls off and hits you and you’re not supposed to fight back?! ?” Here’s where I will ask the help of a Bible scholar, a man I once knew in a church I attended for several years – a scholar whose credentials are solid. According to Dr. Tom Constable’s Expository Bible notes the type of strike mentioned in the Scripture referenced above is regarded as an insult – sort of like flipping someone the bird. Try attacking the next person who gives you the finger and see where that gets you with the judge later on. I could cite Scripture after Scripture of warriors who defended God’s people. However, using history to justify something as Biblical puts one on tricky footing. Just because something happened doesn’t mean it’s an action plan for us to follow. For example, King Solomon dabbled in idol worship. That doesn’t mean it’s OK for us Christians to do the same! I think the pacifism thing is doubled for Christian women because of a misguided notion that women must take a back seat to men in all aspects of life. Most of the Christian women I know don’t take responsibility for their health or safety. I’d like to see them at least take a daily walk and take a self-defense seminar every year! Some women think God doesn’t want women to be strong and/or powerful because those are supposedly strictly masculine traits. A few believe that God will protect them from everything. We all know bad things sometimes happen to good people. I don’t know about you, but I like increasing my odds of survival. Meditation in Karate can be a sticking point for us Christians. There are as many teachings about mokuso as there are senseis. It has never once been a problem for me. I’ve heard of other dojos where the senseis are a bit more enthusiastic about meditation practices that make us Christians uncomfortable. One can either agree to disagree, or find another dojo. There probably are a few dojos out there where the Senseis are downright pushy about mokuso, and that could very well be a good, solid reason to find another dojo. My attitude is no one can control what goes on between my ears during mokuso, so other beliefs and practices are not a threat to me. My soul isn’t in jeopardy just because I happen to be kneeling next to someone who practices something different. In fact, it does me more harm than good to sit there grousing about what that person believes! It’s worth mentioning this can work both ways. There may be some dojo out there somewhere that is run by a Christian sensei who is so pushy about praying during mokuso that people of other faiths don’t feel welcome. We as Christians don’t have to agree with our neighbor, but we do have to love him or her. That doesn’t mean we need to hide who and what we are, but it does mean we need to let people freely choose or decline what Christianity brings to the table. Sorry for the bunny trail, but I know someone would bring it up if I didn’t! Skipping church is another sore point. Karate tournaments are often held on Sundays. I don’t think this blog is the place to get into the interplay of Mosaic Law (Exodus 20:8 – keeping the Sabbath holy) and the fulfillment of the Law through Christ, but if you want to explore that further, it’s well worth pursuing. There’s enough grace in that concept to where many Christian families participate in athletic events on Sunday every once in awhile. Christians like to cite Hebrews 10:25 as another justification to go to church every single Sunday. This Scripture is an encouragement to persevere in the faith, not a mandate to attend every single Sunday school, worship service, and Bible study. I don’t think going to a tournament every now and then is going to cause my faith to waver. Some Christians genuinely do feel they need to refrain from studying a martial art. They understand every instructor and style is different. They don’t judge others but they personally feel their walk with God is better if they stay away from martial arts. They understand they are simply expressing a personal preference. Some have been in abusive dojos, some haven’t. I totally respect that. This is, after all, what the bottom of the pyramid is all about. I would encourage those people to at least be aware of their surroundings, use common sense, and to take a self defense seminar every year or so. I also appreciate their willingness to let me manage my own study of Karate and my own relationship with God. Some of my Christian brothers and sisters would take me to task for not taking every opportunity to get in every karateka’s face about what Jesus has done for them. News flash – I’m not very good at evangelizing. I am a deacon – a “dust raising” servant. I set up tables, cut a mountain of strawberries, leave the memorial service ten minutes early to bring perishable food out of the fridge, and I stay late to put the tables away. Us deacons are every bit as vital and valued as those who are especially gifted at preaching. A deacon is a good person for a setting where sermons aren’t welcome, don’t you think? Very nice! I don’t speak of religion but my message is a Godly one. There are different ways to evangelize 🙂 I’ve had some ask me if it is in-Christian to take a martial art. To me it’s as Christian as anything. Great analysis of the different arguments that can be made. Interesting thoughts. I have found that Karate has made me consider what I believe more objectively to the point where I am not sure that the religion I was brought up with is necessarily as important to me as it once was. It has me internally debating whether it even matters if there is a God (or at least the God construct I have always believed in / build “faith” around. I think the Zen aspects of Karate are extremely interesting……and one of the most useful parts of the art for me. I often find mukoso at each end of the class the best bit as it allows for reflection (on the class and in general) and gives time and space for internal quiet and being alone with one’s thoughts…..as a busy mum of small kids I like this time out! The concept of chi / ki seem to bother my primary Sensei and we have had many discussions about them. Perhaps I see them as more physical than magical constructs and it doesn’t matter to me that ki can’t be “seen” but more important that it can be “felt”. Religion will always cause debate and whilst this is not unhealthy I don’t think it is necessarily relevant in the dojo. Essentially we are all there to train and so that is what we should do. Also with the environment of respect we should respect people of all faiths and otherwise in the dojo and carry this with us into our lives. Funny thing – I’ve been questioning what I believe as well, and I think I’m better for it. I think you’ll find the same thing as time goes by. If we stop questioning, we stagnate, right? I love meditation, especially when I lead it if I’m Sempai (usually at the college dojo). I sort of monitor the class and when I hear people have settled, I hold ’em there while I slowly inhale and exhale once, then I end it. I find it funny that I can teach even when I’m just sitting there doing, well, nothing! There’s a wonderful dialogue in one of the Narnia books by C. S. Lewis. One of the main characters, a human child from earth, meets a man who claims to be a “retired” star (as in twinkle twinkle). The child protests the man can’t possibly be a star, as stars are huge flaming balls of gas. The man replies, “Even in your world, my son, that is not what a star is but only what it is made of.” I know a lady who teaches singing – she could explain kiai on a physical level and give me pointers on how to do it without ruining my vocal cords. But you and I both know there’s more to kiai than what goes on with one’s physical self! Completely agree with you about debate, its relevancy in the dojo, etc. Well said! Thanks for stopping by and sharing your heart! Wow! That’s a lot to digest. To be upfront with everyone, I’m not religious but I do respect all faiths. I’m not one to judge or criticize other people’s faiths. I was brought up Catholic but later in life I just broke away from that. I just felt it just wasn’t for me but I still try to live as the way my parents brought me up…….Anyway, my take is if taking up a martial art makes you happy then do it. Life’s too short to be miserable. I just can’t imagine how taking Karate is a bad thing. The martial arts, in my opinion, isn’t all about combat. It’s probably a small portion of the training. It’s suppose to help you become a well round person with discipline, respect, character etc. With all those traits, that can’t be a bad thing. I always wondered how these people who say that you will go to hell know for sure. Did the man himself tell them personally. We as a society have no right to judge IMO. Bottom line for me, the martial arts can be a positive thing that can be used for good. But that’s up to the individual. Hope that made some sense. I don’t have the writing skill that you and Sensei Andrea have. Anyway, great piece as always. Good luck 😎 All the best and full respect. Thanks for taking the time to share. Yep, life is too short to be miserable 🙂 I agree – how do we know for sure what happens to any given person after death? That’s where faith comes in for those of us who believe in an afterlife. I love it that there’s still some wiggle room in this big ol’ world – wiggle room for us to say, “I don’t know, let’s find out!” Anyhow, thanks for stopping by and sharing your heart. Amen, and amen, brother! I’m sure you practice this yourself 🙂 Thanks for the compliment! My karate journey and my spiritual, christian journey have so many parallels. I had to learn obedience to God as I was learning obedience to the Sensei. I was learning that when you think you have made it, you have so much more to learn, you go deeper. This is true for karate and spiritual journeys. To me, Jesus is the ultimate sensei… He was gentle and patient with the general population (white belts) even though he was so strong and powerful. He was strict, fierce and expected a lot from the lack belts(teachers of the law). He built his disciples from white belts and expected more from them as he taught them, until they too became black belts and strong enough to teach others about the way. The early christians were known as the followers of ‘the way’. Karate is ‘the way of the empty hand’. The ancient philosophy of the martial artists of seeking justice yet being humble can be best described by the prophet Micah who came before … ” he has showed you, O man, what is good and what does the Lord require of you? To act justly and to love mercy and to walk humbly with your God”. I was told by well meaning christian friends how bad martial arts was for me. To me it is a gift from God that has taught me so many life lessons and prepared me for other journeys i have to travel. 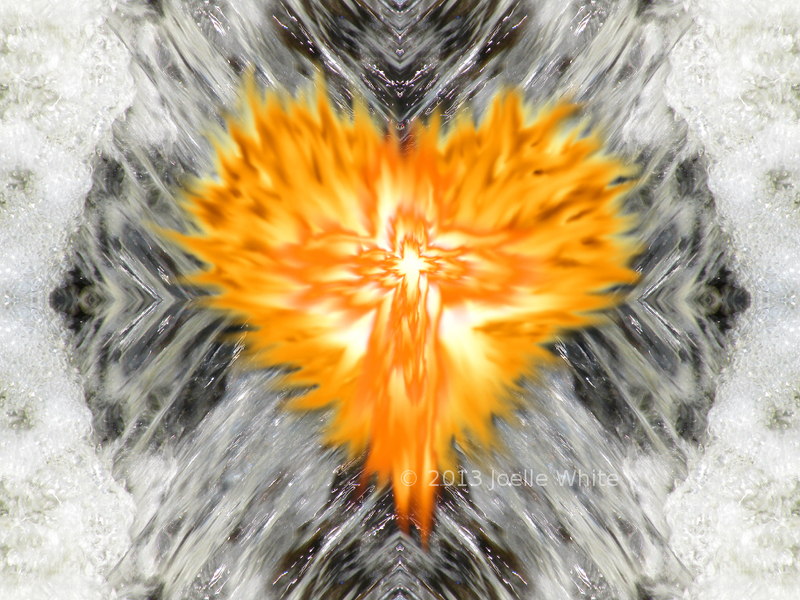 I am stronger in mind body and spirit and I thank God daily for the opportunity learn more and go deeper in both ‘ways’. That is my opinion and my experince. Good Luck with yours. Thanks for sharing, Colleen! Nicely said.